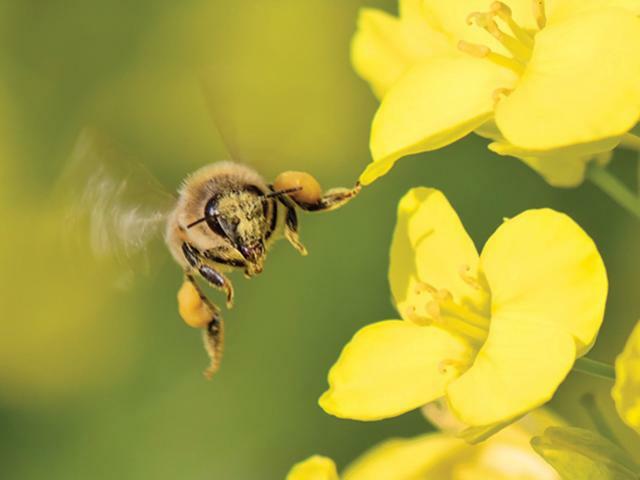 How do field crops affect honey bees? And honey bees affect field crops? Recent research by CFAES scientists has found new answers but points to more questions. Reed Johnson and colleagues have discovered, for example, that honey bees, while foraging, can pick up dust from insecticide-coated corn seeds that has chipped off, drifted away, and landed on trees and flowers. The bees can also pick up the dust when they travel across fields during corn-planting season. Either way, the bees can carry that dust to their hives, where it carries a risk to young bees. In another study, Johnson and a colleague found that 47 percent of the Ohio honey they tested had pollen from soybeans present in it. Honeybees and other pollinators pollinate about a third of the crops grown in the U.S. Together those crops have a value of more than $14 billion a year. Corn, however, is pollinated by the wind, while soybeans are mostly self-pollinated. To contact the scientist: Reed Johnson at johnson.5005@osu.edu.